These colorful girls’ water shorts are made of wind- and water-resistant Supplex® nylon with 50+ UPF sun protection; 3" inseam. As comfortable and functional on land as they are in water, Costa Rica Baggies™ match your girl’s amphibious nature. 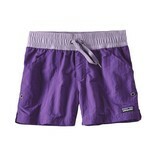 These water shorts combine a hip-sitting fit with a wide, elasticized waistband and external drawstring for a customized fit. Other active-minded details include self-draining hip pockets, side slits and long-lasting reinforced seams. They’re made of supple, moisture-shedding 4-oz Supplex® nylon with a DWR (durable water repellent) finish that dries quickly and provides 50+ UPF sun protection. Inseam is 3".